erusalem - The United States And Israel have denied reports that a harsh phone call occurred between President Barack Obama and Prime Minister Benjamin Netanyahu on Sunday discussing the situation in Gaza. In the purported call transcript published by Israel’s Channel 1 News, Obama allegedly asked Netanyahu to halt all military activities in the Gaza Strip. The White House’s National Security Council has tweeted (https://twitter.com/NSCPress ) that the transcript is false. Netanyahu’s office also said the report was false, using the same statement tweeted by the NSC. It doesn't really matter. The reality is that Obama consistently demands Israeli restraint but has never and will never take a single step towards insuring that Hamas will be unable to place Israel at risk. He is a terror lover, and wants the worst for Israel. I do not feel encouraged when he speaks nicely, as he is a pathological liar, and his true feelings are obvious. Politics as usual to deny private conversations. What the world leaders really think of Israel and Netanyahu we know. We all remember the open mike supposedly private conversation between Sarkozy and Obama where Sarkozy called Bibi "a liar" and Obama responded "You're tired of him; what about me? I have to deal with him every day,"
Contrary to the all prevalent opinion in the Jewish circles, in my not so humble opinion Im certain that president Obama is doing a superb job dealing with current crisis. The constant cries for war from majority of Jews is inane and heedless in nature. Just imagine that Obama would support a broad offensive in Gaza, it would be lethal for the worldwide Jewry, and we would be engulfed in another war. All I have to say is thank you Mr. President!! If you read the transcript, it's like a cheesy movie screenplay. No one talks that way. I expect that Israeli TV station will soon be eating crow and the reporter will be looking for a new job. Well, at least both governments have moved away from this phone call. That has to be an improvement. Bibi, be strong. You are fighting for all freedom loving people everywhere in the world. Hashem should bless you and keep you focused. I know I'm wasting my time because others have tried to educate the Obama haters here and it just goes over their heads. But when you write Obama "is a terror lover, and wants the worst for Israel," you make such an idiot of yourself that I can only cry for the low level of education in our yeshivas. This "terror lover" who "wants the worst for Israel" backed Israel during Operation Cast Lead, backed Israel in the Gaza flotilla incident, backed Israel during the Goldstone Report controversy, stood against the Palestinian Authority at the UN in order to prevent the declaration of a Palestinian state, and told the UN that Israel is a Jewish state (the first president to say that at the UN) and that the ties between the U,S. and Israel are unbreakable. If that's what you consider a "terror lover" who "wants the worst for Israel," then words have no meaning and you must be living in a parallel universe -- a frum Bizzaro World. As is always the case when someone lists the pro-Israel acts of the Obama administration, guys like you, because you operate purely on emotions and preconceived notions rather than facts, respond with sophomoric insults ("get a life") or complete untruths ("Every step of the way Obama stabbed" Israel) but never, ever do you offer any factual counterarguments. You tell me to start reading the news. I do, and due to my job I'm sure I read many more news sources than you on a daily basis, which is why I have facts on my side. I ask you to disprove even just one or two of the points I made in my first comment. “ Contrary to the all prevalent opinion in the Jewish circles, in my not so humble opinion Im certain that president Obama is doing a superb job dealing with current crisis. The constant cries for war from majority of Jews is inane and heedless in nature. Just imagine that Obama would support a broad offensive in Gaza, it would be lethal for the worldwide Jewry, and we would be engulfed in another war. 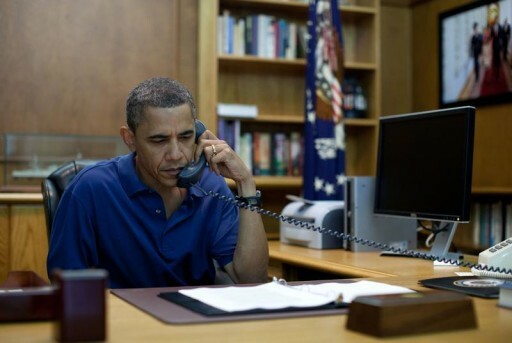 "Contrary to the all prevalent opinion in the Jewish circles, in my not so humble opinion Im certain that president Obama is doing a superb job dealing with current crisis." That 'prevalent opinion in the Jewish circles' is based on a pathological hatred of an African American in the White House, which of course, the President's haters are too cowardly to admit. Instead of being מודה על האמת, they typically and lamely accuse their detractors of racism because that is the pathetic defense they are taught on hate radio by their handlers. They're so ridiculously predictable! What the 'ditto heads' seem unable to fathom is that they align with the Baggers (KKK), who hate Jews just as much as they hate minorities, if not more. The mere fact that there is not the slightest scintilla of objectivity when it comes to President Obama among our היימישער bigots strongly infers that there is a כח אחר מעורב בו involved here, even though they are too cowardly to admit it. “ "Contrary to the all prevalent opinion in the Jewish circles, in my not so humble opinion Im certain that president Obama is doing a superb job dealing with current crisis." "so why is it that a supermajority of republicans suppport israel"
First off, the GOP/Baggers (KKK) support Jews maintaining Israel for reasons you won't like to hear. In their fallacious religion of נצרות, they believe that Jews must control Israel prior to the so called lie of a 'second coming' of ישוּ הנוצרי, when all Jews will convert to נצרות. These are the people with whom you side. 1. Over $3 Billion per annually to assist Israel's military to develop Iron Dome and other defense technology. 2. Signing US-Israel Enhanced Security Act. 3. Selling Israel Bunker Bombs, F-35 fighter planes, and fast tracking arms. 5. Voted 100% of the time with Israel at the UN. There is of course, much more support the President has extended to Israel. But, you go ahead and hate the President for his skin pigmentation, because that is precisely what your handlers and the היימישער bigots expect of you. I detest Obama because of his policies that are anti-America, anti-Israel, anti-Constitution, and anti-democracy. His liberal socialist agenda is a grave danger for all of us, as Americans and kal vachomer as Jews. I could not care a bit about his DNA or skin color. You are foolish for parading around the race card. Even the whites in his administration are as corrupt as he is. You are blinded by the dark. “ "so why is it that a supermajority of republicans suppport israel"
Once again, you are blinded by the dark. Your facts are totally wrong. The aid Israel is getting from America is not coming from the White House. It's coming from Congress. Obama has nothing to do with it. Iron Dome funding is from Congress, every dollar. All of the other items on that list are also because of Congress, not the WH. You know that, and your hiding behind the race issue is cheap and an indication of intellectual challenge. I detest Obama for his socialist, pro-terror policies, which he has displayed in his domestic and foreign policies. In fact, my feelings are equivalent to all the others in his administration who push that agenda, and many of them are white. I haven't a care in the world about his color or race. You are distracting from discussion of the real issues by waving the race card. I have worked alongside co-workers of every race, and our relationships were mutually respectful. My hatred for Obama is not his skin, it's his heart (or lack thereof). You obviously know nothing about the hate for Israel on the Right, among neo Nazis, white supremacists, skinheads, even some of the more extreme Tea Baggers. Educate yourself. "I detest Obama because of his policies that are anti-America, anti-Israel, anti-Constitution, and anti-democracy." You don't just disagree with the President's policies, you DETEST him, which could only be personal. Sure, I thought GW Bush was a total idiot and laughed when he couldn't even pronounce the word nuclear correctly (your kind of President), but I never DETESTED him. Like all the the other היימישער bigots, you're nothing but a flagrant racist who is too much of a coward to admit that you DETEST the President for being black, and I'll call you out on it every time! “ "I detest Obama because of his policies that are anti-America, anti-Israel, anti-Constitution, and anti-democracy." Keep doing that. I only detest someone who is rooted so deeply in hate for me (including Jews, Israel, morality) that has become a tiger that cannot change his stripes. Hating Obama is not the equivalent of racism. I happen to have many colleagues and friends who are black or other races. I even have an Arab colleague with whom I enjoy a mutually respectful relationship. Your decoy of the race card is not only untrue, but is completely pathetic and childish. "what about obama cant pronounce navy corpman called him a nave corpseman"
That's really brilliant, Cletus! Not only can't you spell corpsmen, you can't even spell Navy! Anyone as ignorant as you is the perfect sympathizer of the GOP/Baggers (KKK). Go back to Limbaugh, ditto head! "percentage wise there are more leftists that hate us then those on the right "
You simply make up this lame dribble without citing reputable (I say reputable) sources, don't you? Tell me, does the term delusional have any special significance for you? Go sit with the Baggers (KKK) who hate you (if you are a Jew) as much as they hate other minorities! "I happen to have many colleagues and friends who are black or other races"
"I have many black friends" is the usual statement of the typical feral racist who is too cowardly to reveal what he so pathetically is. Hating President Obama, on the contrary, shows an unbalanced mental state, which you certainly possess, Cletus! If my posts concerning your racism were not true, they wouldn't upset you to the point where you keep repeating your pathological hatred for the President. As long as you are incapable of admitting to what you so ridiculously are, I'm still going to call you out on it every time! Get it through your thick skull- he's black, he's President, and you should get on with your life! “ "what about obama cant pronounce navy corpman called him a nave corpseman"